“If you walk past Daniel Radcliffe’s Harry Potter robe, ride the elevator up four floors, above the ruby slippers from The Wizard of Oz and a family of four visiting from Cincinnati, Ohio, you’ll find yourself in a long hallway that vaguely resembles a hospital walkway. The fourth floor of the Smithsonian’s National Museum of American History is an assortment of offices and storage rooms. 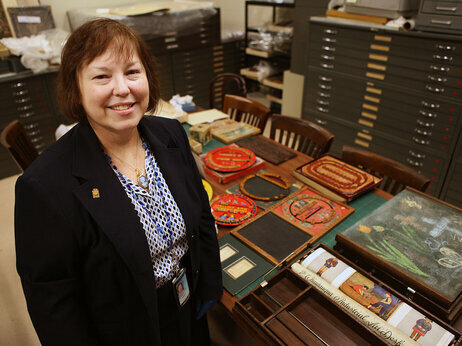 Debbie Schaefer-Jacobs is the curator of the education collection at the Smithsonian’s National Museum of American History. Debbie Schaefer-Jacobs ushers me through a heavy brown door. She’s the curator for the museum’s education collection, and this is one of those days that people like her relish. In this room, below an air conditioner steadily filling the space with crisp, cold air, she’s unpacking — very carefully — a newly arrived collection of items that help tell the story of America’s educational history. These artifacts are part of an 800-object gift to the museum by Richard Lodish, a former Lower School headmaster at the elite Sidwell Friends School in Washington, D.C. Previous Post Huffpost: Are We Raising a Generation of Helpless Kids?